Another four days off from work, and I am thoroughly enjoying another long weekend. Our plans for a big New Years Eve centers around being together here at home, and George went to the grocery for some fresh fish and baker potatoes for dinner, and surprised me with a tray of bacon wrapped scallops ready to cook. Yum! New Years Ever is a good night to stay home and count our blessings. My mother is coming home from the hospital today, and I am so grateful. Pneumonia bad enough for hospitalization is no picnic at age 96. 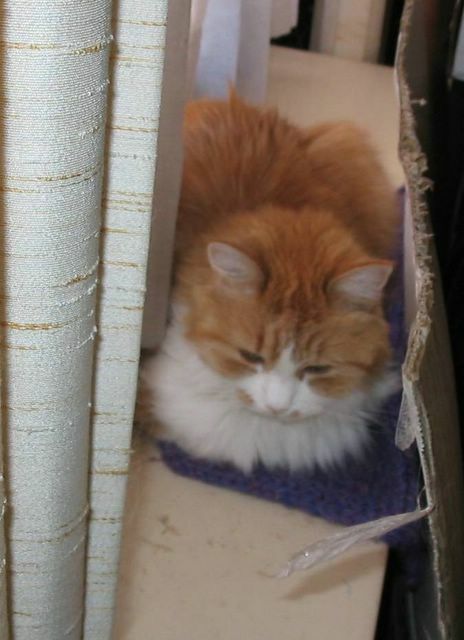 I am thrilled that she is getting better, and there could be no better good news for me to round out 2005. Best wishes to all and have a very healthy New Years Eve. This Christmas, I really wanted to be relaxed, and not hectic and hurried. I think I almost accomplished that. Mike arrived on Thursday, and we had an easy dinner out. Friday was last minute Christmas shopping until the stores got crowded and the parking lots were filling up. We retreated to our house, and I made a turkey dinner with all the trimmings so that we would have yummy leftovers and I wouldn't need to cook on Christmas Eve day. 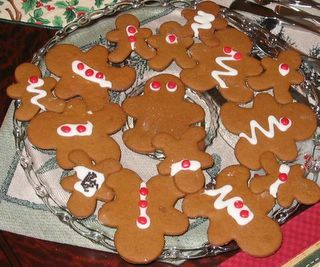 George and I made two batches of cookies: spritz with color sugars, and a new recipe for date/pecan refrigerator cookies. Both were delicious. We ran out of time before we got to the sugar cookes and the gingerbread boys. Frankly, since I also made an apple pie, we didn't need any more cookies for three people!!! We went out for a Chinese dinner on Christmas Eve and then to church for the 10:00 service where I played in the bell choir. We stayed up until after midnight! That is a big deal for George and I...the early to bedders. Christmas Eve day I had a chance to knit on a new stole, and I continued with that relaxing project all through the weekend. I'm halfway done. Christmas Day, George went to church, and Mike and I had a leisurely breakfast, and then we opened some really beautiful gifts. George got a new digital camera, we got lots of wonderful movies and books, and I got a strand of beautiful pearls. There is more. The list is long. I knew I had accomplished my goal of a relaxing weekend, when I found myself lying on the couch reading my new book that Mike gave me, The Six Wives of Henry VIII, on Christmas afternoon. Bliss. Christmas Day was a nice Honey Baked Ham dinner with cinnamon apples, tossed salad, baked potatoes, and Honey Baked beans, with a friend invited to help us eat it, and all enjoyed another day that seemed well-planned and not hectic at all. Christmas was like clockwork this year. The whole Christmas weekend was like that. 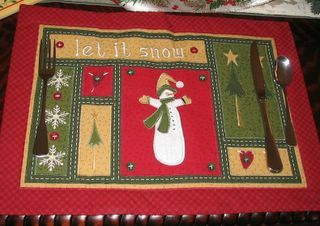 The weather was mild, the presents were plentiful and wrapped well before Christmas morning (unlike some years), and the food was planned to be delicious but not to keep a cook in the kitchen the whole time. Tonight we have company invited for turkey and ham sandwiches, Baked Beans, Christmas cookies, leftover cheesecake and apple pie. We even have efficient plans for the leftovers. Thunder found a warm spot. 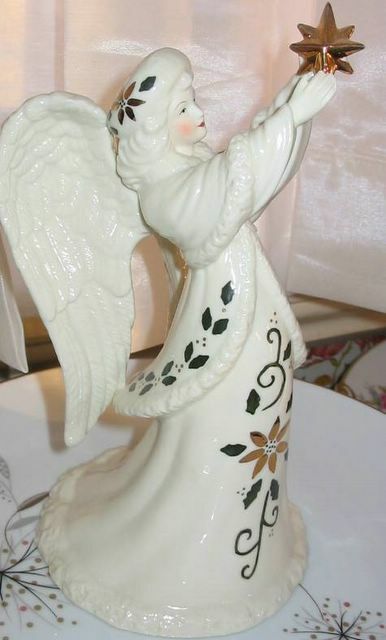 My favorite Christmas decoration. I like it so much, I leave it out all year. Michael is here! Christmas has begun. He has been here for five hours and we have already cleaned out my computer files, wrapped packages, gone out for dinner, shopped at Best Buy and the supermarket and watched half a movie (Good Morning Vietnam). It is so much fun to have him here. Tomorrow is coffee at Barnes and Noble, along with some last minute Christmas shopping and cookie baking. Lots of recipes up my sleeve, and I can't wait to get started. I got up early this Monday morning, to work on my to do list for Christmas, and think about what needed to be done for our office open house tomorrow morning. 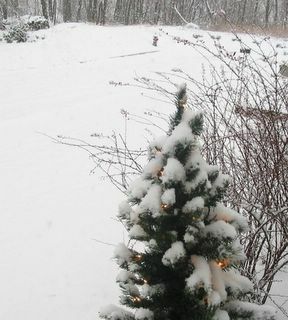 I lit the candles, made myself coffee, turned on the Christmas tree lights, and was quietly enjoying dawn's early light. In a few minutes, George joined me, went to the kitchen to get his cereal, came back to the livingroom and spilled milk all over the cat. Thunder just happened to be in the wrong place at the wrong time. After leaving a trail of milk drops across the floor, she is now in the kitchen busily trying to take a kitty milk bath. It is a busy time of year. 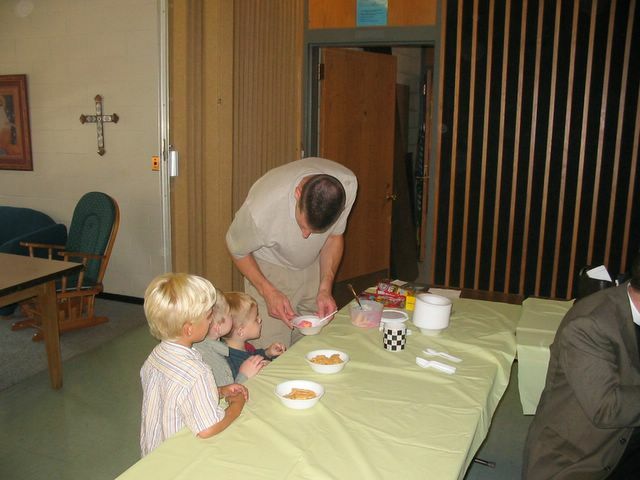 Yesterday I taught Sunday School, and the time I'm with the kids just flies. Looking at those pretty little faces looking up at me, and seeing how industrious they are about looking up the Bible verses and doing the puzzles and crafts, really brings to me the true meaning of Christmas. The last of the Advent candles are lit, and next week Christmas is here. Tomorrow is my office open house, and I have lots to do to pick up the platters of fruit, cheese and baked goods and prepare the coffee and punch and have it all set up by 8:00 a.m. It was my idea to have an open house, so I do it willingly and George will be there to help me do the schlepping. It is hard to realize that Christmas Day is only one day, and a quiet one at that. All this bustle is the real "fun" of Christmas, and we might as well enjoy ourselvs in the process. George and I bought a new cookbook. I haven't bought a new cookbook in years I don't think. 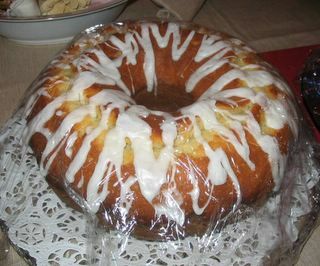 Now that you can get every recipe known to man on www.recipesource.com, cookbooks just weren't necessary. But we saw this beautiful cookbook at Barnes and Noble when we were shopping for Christmas presents and couldn't resist. 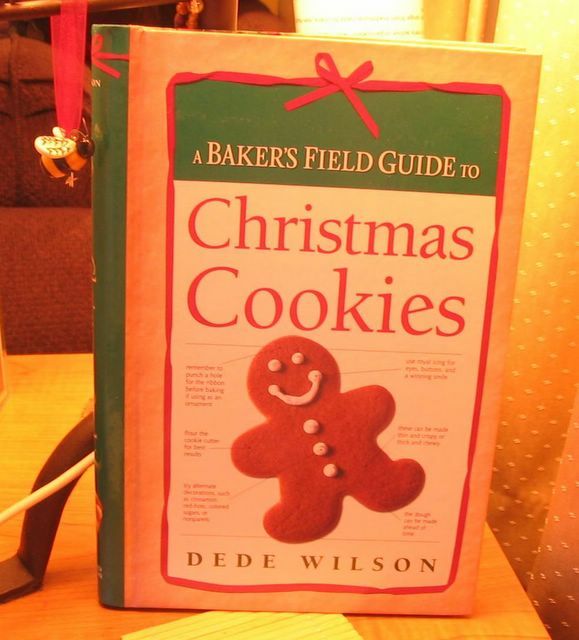 The book is called A Bakers Field Guide to Christmas Cookies by Dede Wilson, and has ALL the classic cookies, like Gingerbread, Sugar cookies, Springerle, Spritz, Pfeffernusse, Thumbprint cookies, Vanilla Crescents and Moravian Ginger Cookies. It is a wonderful little book and as George said this morning, "We gotta get going on them". We have the butter, the sugar, the flour, and the spices. Cookies are amazing little critters, since they are all just a variation on a wonderfuly sweet theme. George and I were still Christmas shopping last night in a Kohls store at 10:30 p.m. It was midnight madness sale and we had a $20 Cash Coupon to use. We went to a Christmas Party first, and had dinner and cokes, and then people started smoking and the music (kareoke) got loud, so we said our goodbyes and and went shopping. We had fun at the party, but staying a long time at parties is not our scene. We'd much rather be up early making cookies and wrapping Christmas presents. It is the Saturday before Christmas and there is lots to do. 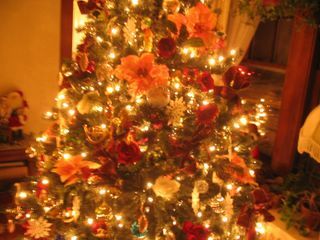 Our Christmas Tree at night, with peachy pink poinsettias, white hydrangea blossoms, red roses, white snowflakes, lavender & pale green balls and big maroon and gold bows. This is NOT your traditional Christmas tree! George and I worked our little patooties off this weekend getting the house ready for Christmas. First on our list was some early Saturday morning Christmas shopping. We hit the stores at the right time and found many things that we think our family and friends will like. We had coffee and cocoa at Barnes and Nobel and I bought a fun book of Christmas cookie recipes that I just HAD to have. I plan on making candy cane cookies this weekend. We went to the storage unit that we rent to get out the pre-lighted Christmas tree that we bought last year. It was big and beautiful in the store, and we set it up last year and really loved it. Then...reality struck when we had to take it down and put it away. These trees will NEVER again fit in the box they came in, so we wrapped it in three large black bags. As we were taking it out of storage on Saturday, we were amazed!! at how heavy it was. Somehow, when you are smiling up at these beautiful trees on display, you don't even consider whether you will be able to lift them or fit them in your car. But we got home with it, set it up and I decorated until my back hurt. We worked really hard on it, and I love my Southern Christmas Tree. George put up lights outside to my "grand design". We decided that each year it is a little harder because I always come up with something different I want to do. This year we put two small trees on either side of the door, and a garland that frames the door, hanging on the posts. We have a big lighted wreath and I'm going to put small red bows on the trees--something I liked in a Martha Stewart magazine. We are going to skip the icicle lights this year. Each year, when Michael comes, we have a "tradition" of driving around looking for droopy drawer lights. This may sound silly. It IS very silly. It just started when I was appalled at how many people put up icicle lights and drape them off their houses in a scallop pattern. Have you ever seen icicles hanging in a loosely draped pattern off a roofline? Not. Icicles hang hard, cold and straight across. So, now we drive around looking for these "droopy drawer" lights and have even though of surrepticiously leaving little flyers on doors that say, "You have Droopy Drawer Lights. Merry Christmas." We are not finished decorating, and haven't even begun the wrapping and packing, but...Christmas is definitely here! George and I went shopping this morning, and by 9:00 we were in the store with our list. We managed to get most of what we needed in three separate stores and had time to stop for hot chocolate, coffee and scones at Barnes & Nobel while we shopped there. We had a good time. I usually don't have problems with Christmas shopping. Maybe it is because I go with an idea of what I want for each person, but I'm open to suggestions. If the store puts out something that I like,...then why quibble. I buy what I see rather than shop for hours for something that I can't find. I think people on our list will like our presents, and we had fun doing it. Afterwards, we made a trip to the storage unit to get our big Christmas tree. It is artificial, and suits us fine. I spent the afternoon putting on ornaments, and adding my special "southern" touch of silk and flocked poinsettias, roses and hydrangeas. I add the big maroon and gold bows, and...voila...a very pretty tree! I came up with this idea two years ago when we visited New Orleans and Mississippi, and saw the trees there that were decorated with flowers instead of tinsel. I loved it then, and came up with our own version. At a hotel in New Orleans, they had a white flocked tree decorated with huge navy blue bows and gold ornaments. It was a knockout. Tomorrow we will decorate the porch, put up the new candy cane lights on the lawn, and make a batch of cookies. Today is one of those days that you dream about. A snowy day, and both George and I have the day off! We had planned to put the Christmas tree up this morning, but George reminded me that it is in its big box in the storage unit, which is a long snowy drive from here. We think the roads will be plowed by this afternoon and we will be able to do errands and some Christmas shopping. This morning I made a pair of chandelier earrings before I even had my first cup of coffee. I have a lot of beads waiting, and today seems like a good time to get to it. We also plan to decorate the front porch railings. I bought artificial greens, large sparkly poinsettas and tiny red lights. The Christmas Tree will be in our southern tree again this year, which is covered with huge flowers and bows. I can't wait to get started! God is good. Today is truly a blessed day, full of decorating, jewelry making, and cookie baking. What could be nicer. A view from the front porch. The to-do list is getting longer, which means that Christmas is almost here. Besides the lights to be strung, the tree to be decorated, and the cookies to be baked, there is an open house at our new office, a Christmas luncheon, and special Christmas practices for the bell choir. At home, at work, and at church, things are very busy. It is also "gift" time, and besides buying things for my family, I am making jewelry for other people to buy to give to THEIR families. Wow. Things get heated up aruond this time of year. Michael made his reservations and gets here on the Thursday before Christmas. We have already bought the turkey for Christmas dinner, and I'm going to get a spiral baked ham as well. Time to invite someone else over to help us eat it. Today was my first day as Sunday School Teacher. I like it! I had four young people in the class this morning and we had a great time. 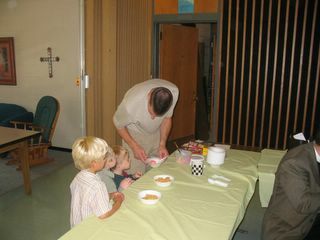 They were eager to read and study the Isaiah verses and were wonderful at figuring out the puzzle in the workbook. We talked about darkness and light, and the promise of the Messiah and what that meant to a dark world. We strung Christmas lights on our table, and had a great time getting to know one another. It was a good hour and I'm happy that they have accepted me as their new teacher. Sometimes blessings come to us when we are least expecting it. I never intended to teach, but answered a call to come in for two months, and today I asked to make it permanent. I love it and I'm sure I will learn as much as I teach. Don't let the turkeys get you down! George and I were leaving for work this morning, both of us going out the door at the same time. We came to a sudden stop. There, going down the front walk, were 24 wild turkeys. They looked like they were taking a leisurely stroll in the neighborhood. 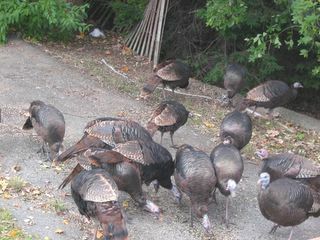 I came back in the house to get something, since there was no way we were going to be pulling our cars out into a gaggle of turkeys. I went out later, and both the turkeys and George were no where to be found. As I got into my car, I see George standing in his white shirt and tie, pouring seed from a liter jar onto the driveway, surrounded by all 24 turkeys! He looked like he was feeding the ducks. He looked at me in wonder, and I had to laugh out loud. What a great sight to see as I was pulling out of the driveway. We are wondering where on earth these turkeys go during the weeks when we do not see them. There is a small woods near our house, but development has carved away at it until it is almost non-existant. We talked about the fact that wild turkeys live in trees. They live somewhere nearby, that is for sure. And then, George was wondering why they don't come back more, since we are obviously soft touches, as we scramble to get another liter jug of bird seed every time they come to visit. I have had a busy week, and there is another craft show on Saturday. I need to hurry and make more jewelry, since Ebay sales have been good, and my inventory is way down. Too busy to talk more turkey.